The Dallas Cowboys have watched their playoff hopes come to an end the last two seasons during Week 17 losses on the road. Sunday night against Philadelphia will give the Cowboys their third try at winning the NFC East in the final week of the season, only this time they will have home-field advantage. And because of that, Cowboys owner and general manager Jerry Jones is expecting the largest crowd of the year at AT&T Stadium. 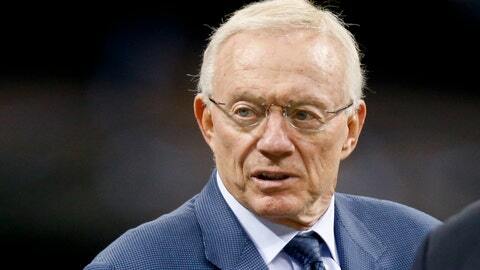 "It’s so critical," Jones said Friday morning on 105.3 The Fan [KRLD-FM]. "The away game aspect when we have to go to the East â New York or Washington or certainly Philadelphia â that’s such a hurdle to overcome. We’re going to have great weather or great conditions to play in because we’re going to be in our AT&T Stadium. But more importantly, we’ll have our crowd there. "This could be the biggest crowd of the year for us. We think it will be. We’ve got them hanging from the rafters to get in to see this ballgame. It should be without a doubt the most emotional and the most involved crowd that we’ve had, which means a lot of noise, which means a lot of third-down, fourth-down interference with their offense, which is cricket today in the NFL. It’s part of the sport of the game now to have the home-field advantage or disadvantage if you’re the opposing team. "All of that makes it a reason why they give the home team an advantage when they bet these games. Having said all of that, it is something that we really need to hang our hat on." The largest crowd for a Cowboys home game this season came during an Oct. 6 loss to Denver as 92,758 filled the stadium in Arlington. The Cowboys are 23-17 at AT&T Stadium since the venue opened in 2009. Dallas is 5-2 at home this season.